Of course, you know you should eat right and exercise. Most everyone understands the importance of fitness for health. Why is it so hard to stay motivated then? Consider the things that inspire you toward fitness. You may enjoy a particular healthy recipe or be a fan of a certain professional athlete. You might have a goal of running a race or participating in a certain sporting event. The primary benefit of sports massage is to improve blood to the muscles. Sports massage is a highly effective healing technique also moves oxygen and nutrients to muscles. After you exercise, lactic acid builds up in the muscles. Sports massage can eliminate lactic acid buildup. You can decrease your recovery time by simply eliminating lactic acid buildup and improving the flow of lymphatic fluids. This process promotes the healing process (http://www.howtobefit.com/massage-for-runners.htm). elevation (RICE). A frozen water bottle is an affordable way to ice the muscles and massage them at the same time. The ice will reduce the swelling and soothe your extremities as you roll your muscle with the water bottle. Consider this low-cost at-home massage remedy after your workout. Tennis Ball – If you don’t need the ice, try a tennis ball to massage your muscles. Tennis balls can also be used on the back and legs also. This method is effective for working out the knots in the foot. 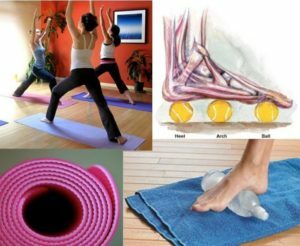 You can roll the feet over the tennis ball from toe to heel for the most effective results. where the soup cans are applied, recovery will begin. This will prepare you for your next workout session. PVC Pipe – this is an inexpensive alternative to foam rollers. 10″ pipe is best and it is easy obtained from your local Home Depot or Loews. If a little cushion is needed the pipe can be wrapped in several layers of contact paper and secured with duct tape. You can then use it to massage your calves, hamstrings and even you lower and upper back just by rolling on it. It will easily break up the toxins that are located within the muscle and allow them to pass through the membrane and out through the endocrine system. that is attainable and reasonable. Yamuna Body Rolling – Better than Foam Rolling?